It wasn't just the abject surrender over the Brexit vote, the resignation of a close ally, or the rumours of his planned retirement. No, it was the statement that the fightback starts here, and then what followed. It should also be worth mentioning that he had a relatively good performance at Prime Minister's Questions, with a series of leaked texts about the Surrey Council social care funding deal. These minor victories only count for something if you then dominate the narrative thereafter. Pushing the government on their weak spots - that they are unfair, sneaky and look after their own. "In a tweet both tragic and comic, Corbyn reflected on this disaster with a declaration that the “real fight starts now” – as if the parliamentary decision to trigger article 50 were a pantomime, and what really matters is waving placards and all the shouting into a megaphone in Hyde Park that now follows. That’s his comfort zone, and he should be allowed to retreat to it. But it leaves the rest of us in a zone of discomfort and distress, watching as a government cruel enough to shut out the world’s most helpless children leads our country off a cliff, unchecked by an opposition that isn’t worthy of the name." The very next day he started on the BBC sofa by attacking a legitimate question as "fake news" with the same insolence he greets any attempt to point out the hopeless situation he is in. He then headed up to Ashton-under-Lyne to meet New Charter Homes, the Housing Association I am on the board of. I wasn't involved at all, I didn't even know about it. 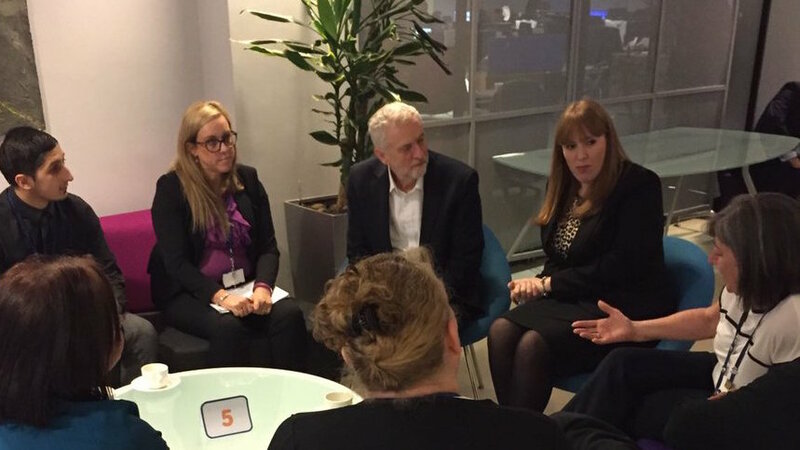 But colleagues had the expectations that he would be open to conversations about how Housing Associations can contribute to solving the homes crisis. This is where Corbyn supporters claim he is at his best, with ordinary people talking about their challenges. And, to be fair, I hear from colleagues that they enjoyed his visit. But here's the thing. He doesn't listen. He doesn't learn. He doesn't understand the world as it is. His tweets that followed said he had enjoyed his day and that he was pleased to see a Labour Council supporting the building of more council houses. He also tweeted that he spoke about the need for more council homes. It might seem a pedantic question of words, that council housing and social housing are interchangeable. They're not, of course, but there is something else here. Housing Associations have a whole range of challenging issues that the leader of the opposition needs to understand and should be able to assist with. Nor was there any recognition of the wider social mission that a non-state actor provides in a community like Ashton. The local MP who was with him will also have told him that. In his reshuffle he has sacked the elections co-ordinator two weeks before two by-elections Labour could lose. I fear for Andrew Gwynne, given an almost impossible job as the replacement. Corbyn has lost the support of Owen Jones, one of his important critical friends. Poll ratings are still falling. This is, as Matthew Engel writes in the FT magazine today, the behaviour of a party on a slow death march. Labour is in many ways clueless, disunited and perhaps in terminal decline. Whatever happens in the by-elections, it faces another crisis in the mayoral elections in May: the Tories are now favourites to win in Birmingham and there are worries even about Corbyn’s former rival Andy Burnham in Manchester. The tragedy of this situation is that Andy Burnham's campaign is seeking to do all the right things that a listening, responsive and modern Labour candidate should be doing to address the challenges of Greater Manchester. I don't make this point to rerun the 2015 leadership but to illustrate the dire position Labour is in, even when it says and does the right thing. If this is the fightback, I dread to see the state of a surrender.